Condition: Very good. Folded. Linen-backed. NOTES: An eleven year anniversary gift from my partner and currently awaiting framing after which it will go up in the “Carpenter Kitchen Corner” along along with a Vance Kelly Prince Of Darkness print and a trio of select Chirashis. My relationship with Carpenter’s films has been lifelong. His bleak yet wry tones, expert command of tension and effects, beyond-quotable anti-heroes and his run 76-88 run is almost unbeaten in terms of quality consistence (especially for someone so genre). Escape from New York and its U.S one-sheet was my entry point to his world and a film I revisited slavishly on VHS throughout my childhood (despite being constantly disappointed that Lady Liberty’s severed head never featured). I soon blitzed my way through JC’s output, adoring the genre-mash of Big Trouble in Little China, the pure-white fear of The Thing and the constant smirk-fest of They Live. 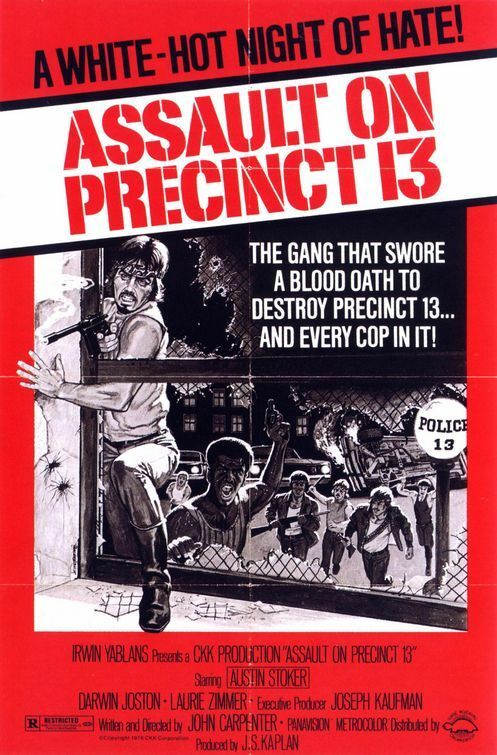 I caught Assault On Precinct 13 late in my exploration, viewed on a less than ideal VHS retail release: 4x3 and murky to say the least. However, the mid 90s Elite Laserdisc changed everything: the correct scope framing, crisp audio and passionate extras (including - I believe - the first audio commentary track I ever heard) opened my eyes and ears to the beguilingly desperate and reverential homage this is. JC’s finest? My mind changes on that every day. The score, on the other hand… I’d say yes. I’m especially fond of its ‘The End’ disco funk remix - something that never fails to put a smile on my face after someone’s put a bullet through my ice-cream.